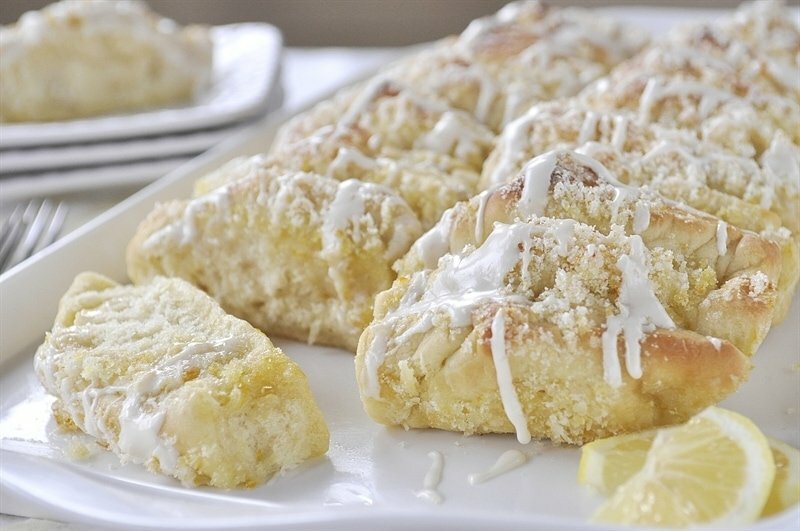 Enjoy a bite of springtime with this amazing lemon foldover coffee cake. 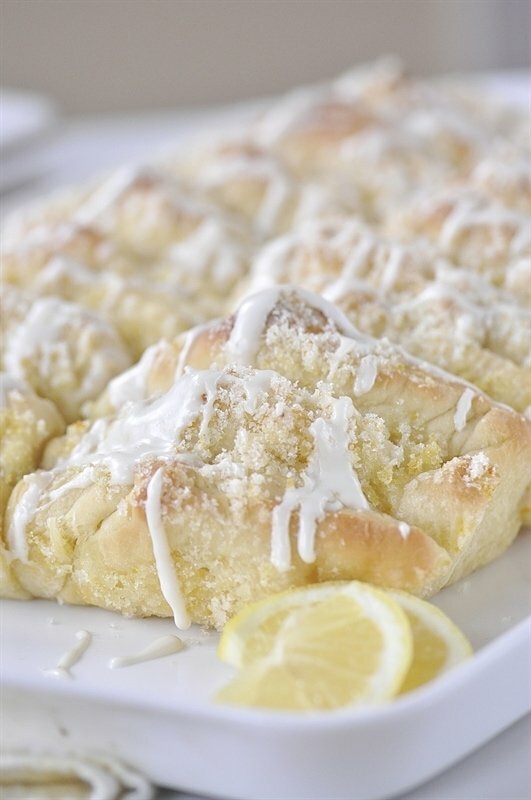 I am a sucker for any recipe that has lemon in the name! A few weeks ago I was craving a little sunshine and springtime on a dreary, rainy Pacific NW day and I came across this recipe for Lemon Foldover Coffee Cake and I just couldn’t help myself. I figured it was the perfect way to bring a little sunshine into the day and besides that I had a jar of lemon curd on my self just begging to be used. I gave you fair warning earlier this week that lemon season is here. If you missed the yummy Lemon Poppyseed Cookies I shared earlier this week – check them out! 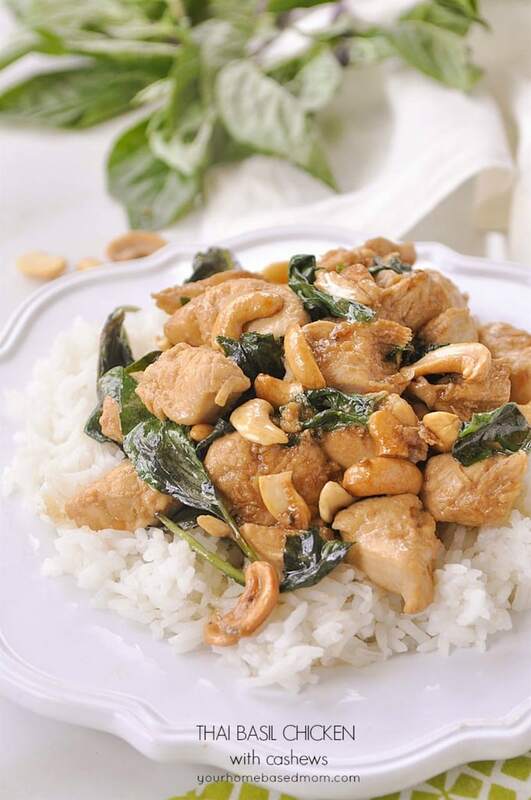 You know this is a good recipe because after my husband tasted it, he made me promise not to give it all away. He loved it and I loved it! I did share some because I knew we would eat the entire thing if I didn’t! 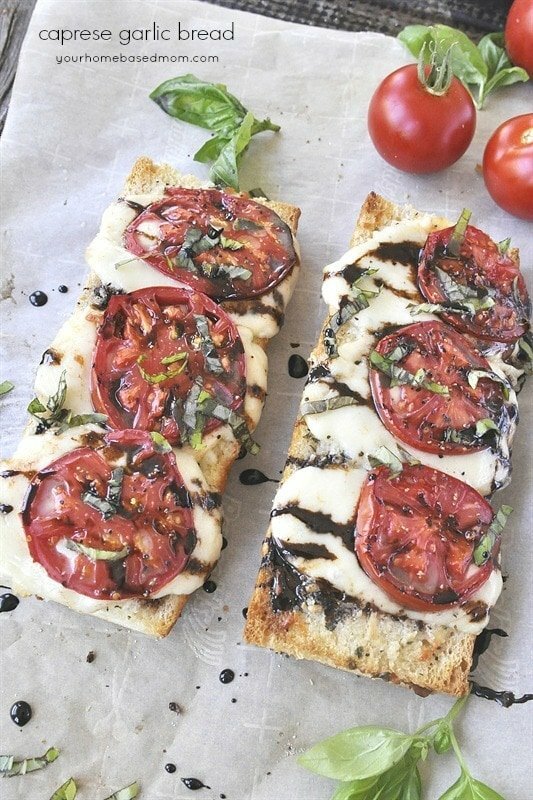 Besides being delicious they are fun to make too. 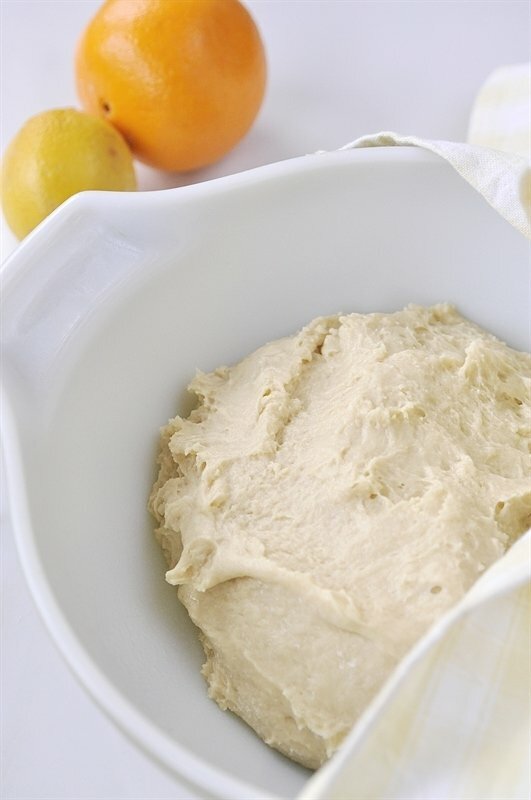 It is made with a yeast based dough so if you are scared of yeast and need some tips for working yeast check out this post. After your dough has risen roll it out on a floured surface to a 18 x 12 inch rectangle and cut into eighteen 4 x 3 rectangles. 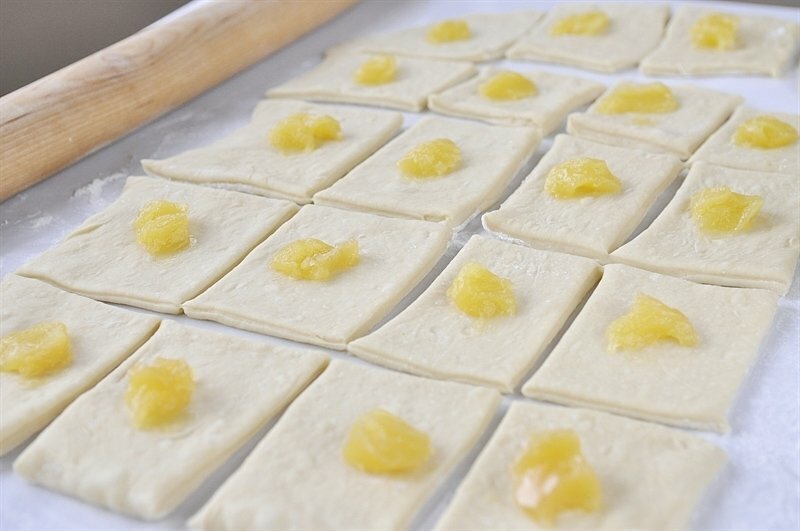 Add a teaspoon of lemon curd onto the center of each rectangle. Fold each piece in half diagonally to form a triangle. 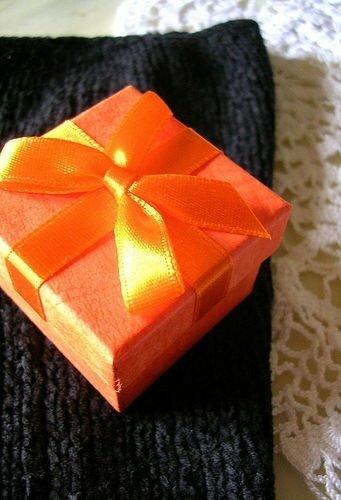 Be sure and seal the edges closed. 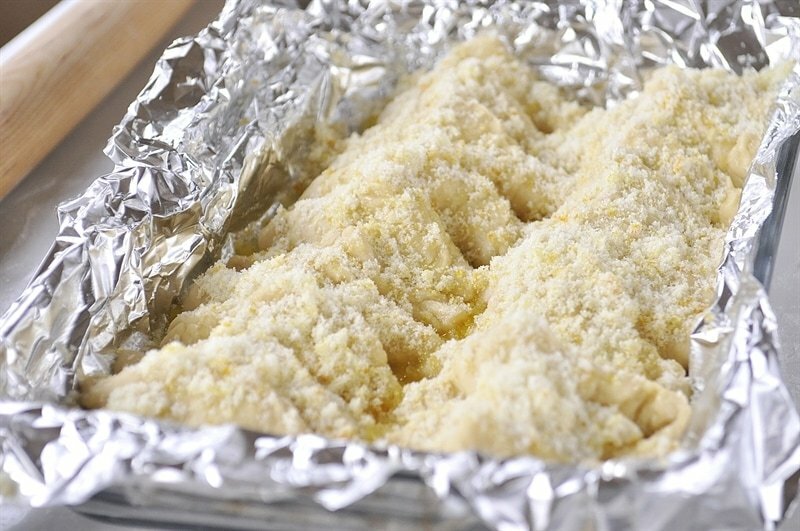 Place the pieces into two lengthwise rows in a greased, foil lined 9 x 13 pan with the point up. 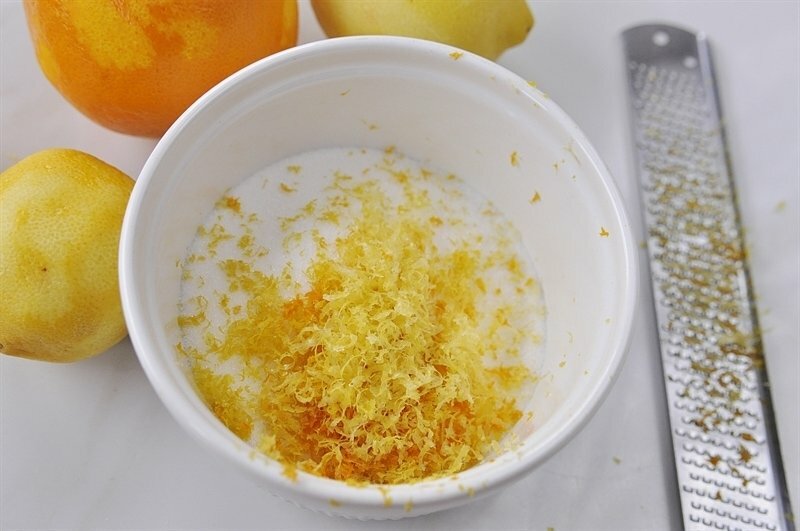 Combine 1/2 C sugar with lemon and orange zest. Mix well to release the oils from the zest. Sprinkle sugar mixture over triangles and then drizzle with melted butter. 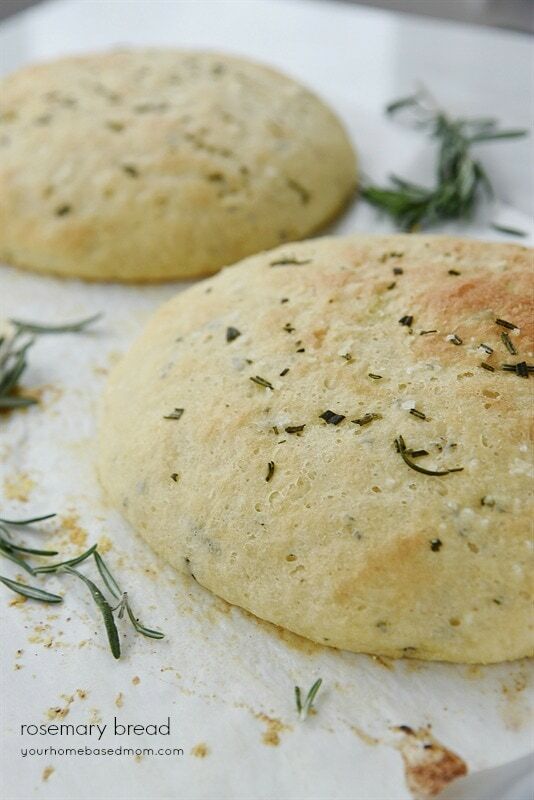 Bake at 350 degrees F for 25-30 minutes or until golden brown. Cool in pan for about 10 minutes and then lift by the foil and place on a cooling rack. 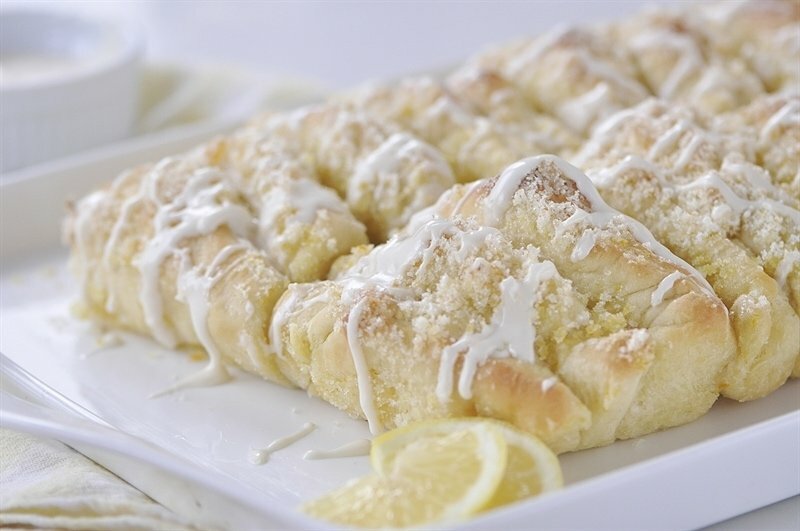 Drizzle with lemon cream cheese glaze. 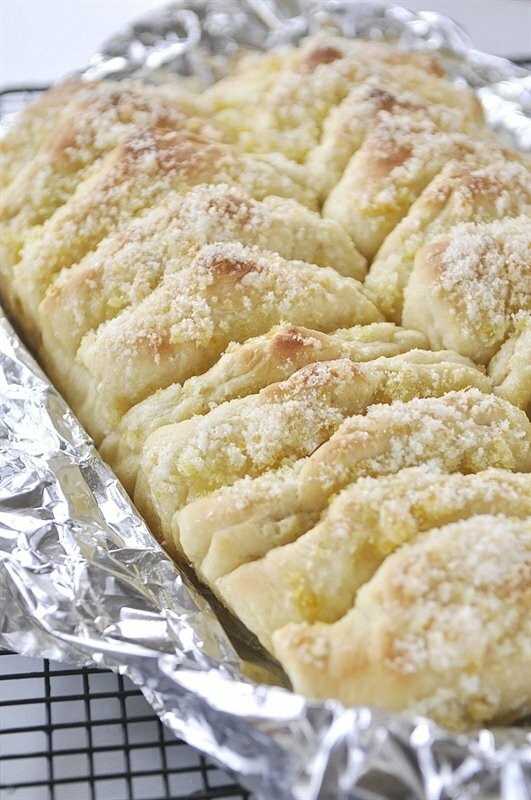 Then break off a piece and bite into a little soft pillow of lemon heaven. 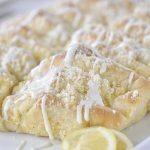 This Lemon Foldover Coffee Cake would be the perfect addition to an Easter brunch or really any time! Add yeast to warm water and allow to stand for 10 minutes or until foamy. Lightly beat eggs and add eggs, buttermilk, 1/3 C sugar, 1/4 C melted butter, vanilla and salt to yeast mixture. Beat in 2 1/2 C flour wtih a mixer on low. Beat for 5 minutes. 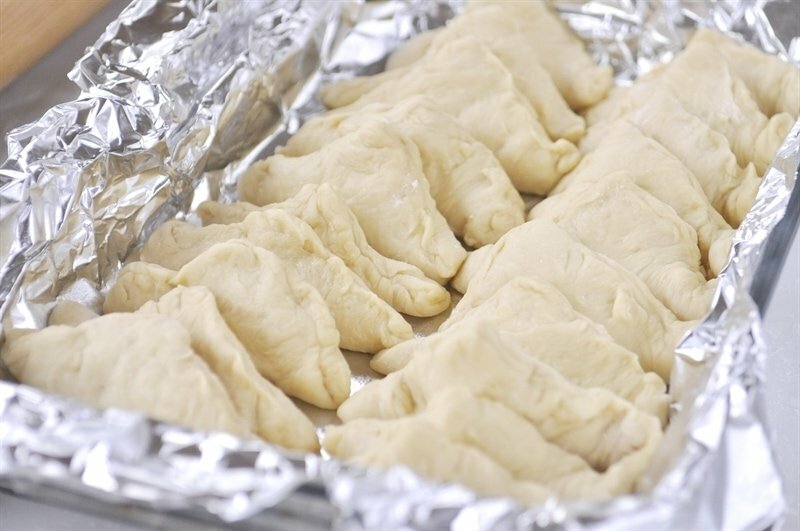 Add in as much remaining flour as needed to make a soft dough, will be slightly sticky. Cover and let rise in warm place until double in size, about 1 hour. Combine 1/2 C sugar, lemon and orange zest and stir to release the oils from the zest. Line a 9 x 13 pan with foil and grease. Punch dough down and put on a lightly floured surface and roll into a 18 x 12 inch rectangle. Cut into 18, 4 x 3 inch rectangles. 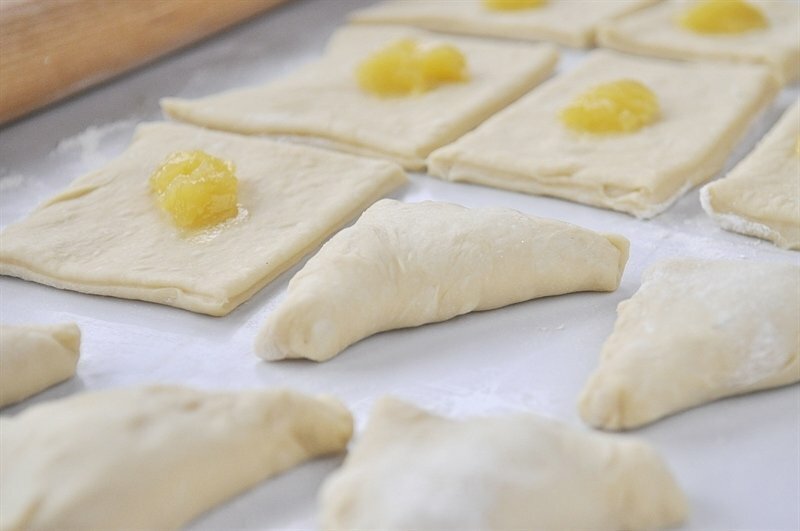 Spoon a rounded teaspoon of lemon curd into the center of each and then fold over into a triangle, seal edges. Place triangles in prepared pan with point sticking up. Make sure edges are sealed. 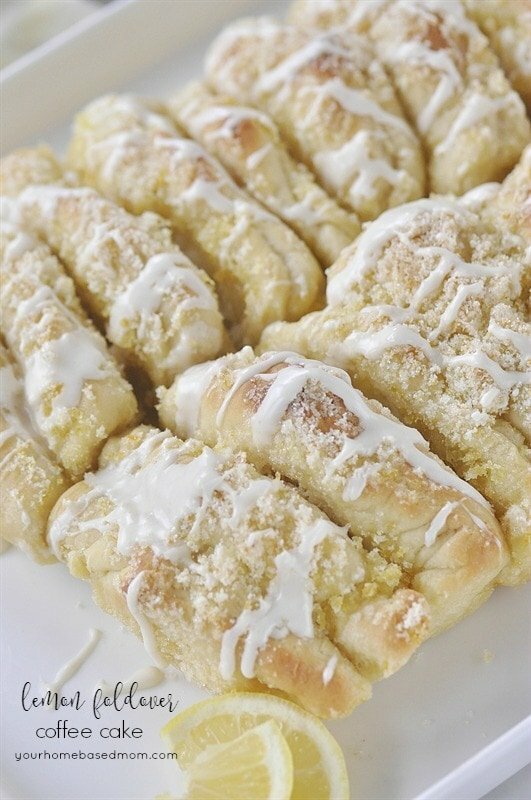 Drizzle with 1/4 C melted butter and sprinkle with sugar mixture. 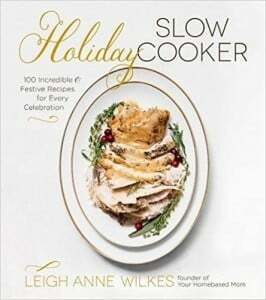 Preheat oven to 350 degrees F. Bake 25-30 minutes or until golden. 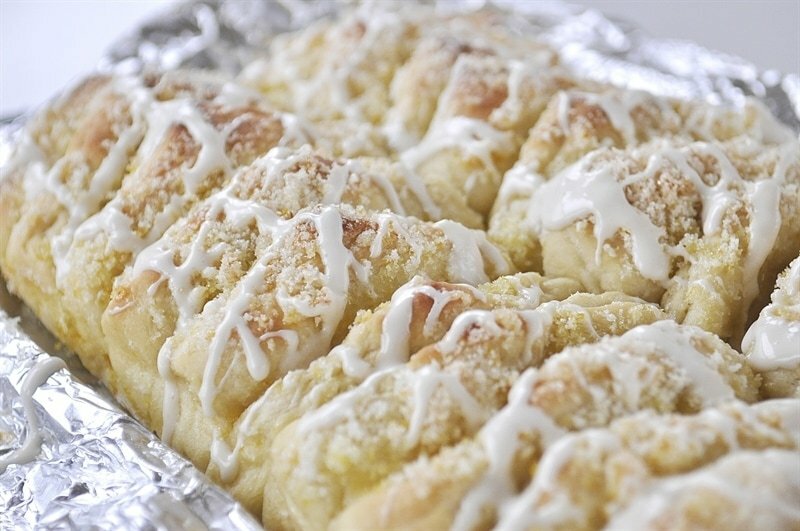 Add in 1 1/4 c powdered sugar or more if needed to create a nice drizzling consistency. Drizzle coffee cake with glaze. 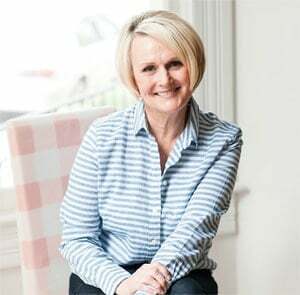 I’d like to pin your recipes to pinterest, but most of the time they don’t go through. Not sure why. It looks delicious. 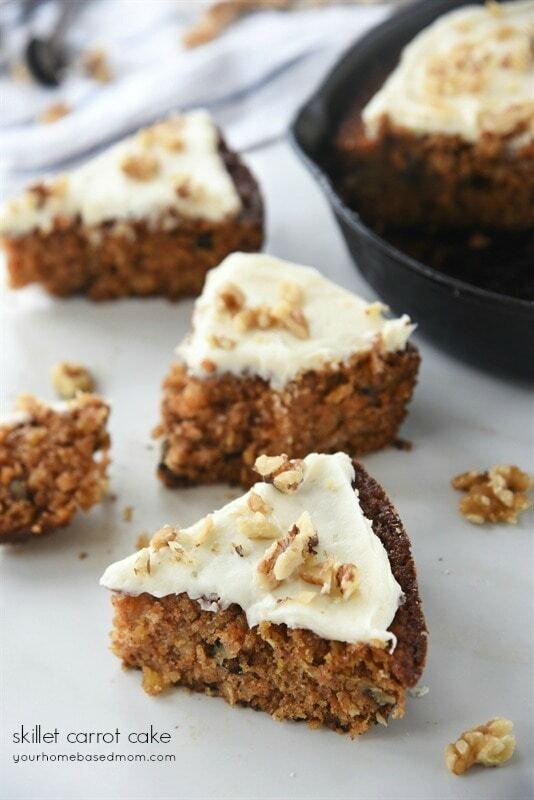 Did you get this recipe from Better Homes and Gardens Fall Baking magazine?